Rescue teams are working to free six miners trapped after a tunnel in a coal mine gave way in the western US state of Utah, local authorities said. No contact has yet been made with the miners, trapped 1,500ft (457m) below ground after the collapse at Genwal mine at about 0400 MDT (1000 GMT). Initial reports suggested an earthquake triggered the incident, but experts have since cast doubt on that theory. 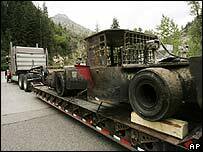 The mine, near Huntington town, is 140 miles (225km) south of Salt Lake City. Utah Governor Jon Hunstman told Reuters that rescuers were making progress. "The experts tell us that they are [alive] and the rescue attempts are increasingly close to the cavern where they think they are located." He said he intended to meet the families of the missing workers, adding: "Hope is in order at this point. Heavy doses of hope." 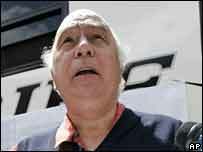 Robert Murray of Murray Energy Corporation - the parent company of the firm which runs the mine - said 200 employees and four rescue teams were working on freeing the miners. "They can be in a chamber in there that's 1,000ft long or they could be dead," he said. "There's no way of knowing right now, and what we need to do is get access to that chamber. "All that is humanly possible is being done to gain access to these trapped miners." The US Geological Survey reported a 4.0 magnitude earthquake at the moment of the mine collapse, prompting speculation that the quake had triggered the cave-in. But the USGS National Earthquake Information Center raised the possibility that the collapse could have caused a seismic wave. "If you have a mine collapse, there will be a seismic component," said the organisation's Harley Benz. "We simply don't know at this point," he said, adding that it could take 48 hours to analyse the information. At least half a dozen other mine collapses since 1995 have caused similar seismic waves. One in south-western Wyoming had a magnitude of 5.4.